Background: Rheumatoid factor (RF) and anti-cyclic citrullinated protein (ACCP) estimation have been used to improve the diagnosis of rheumatoid arthritis (RA). However, their role in prognostication of RA, individually and in combination, is not well studied. This is, especially, true for Indian patients. Methods: Consecutive 945 patients who had their RF and ACCP determined were included in the study. They were followed up for 3 months to 24 months. Swollen joint count, erythrocyte sedimentation rate, disease activity score 28 (DAS 28), and Indian version of Health Assessment Questionnaire (HAQ) were checked during each visit. They were treated with conventional disease-modifying agents (DMARDS). Results: At presentation, patients with both antibodies positive had the most severe disease, while those with both antibodies negative had the least severe disease. Among discordant antibody status (one antibody positive and the other negative), patients with ACCP positivity presented with higher disease activity than with RF positivity. Patients with dual antibody positivity were much less likely to be in remission than with both negative antibodies. The percentage of patients in remission were 34.2, 29.5, 32.4, and 24.7, respectively, for RF−/ACCP−, ACCP+/RF−, ACCP−/RF+, and ACCP+/RF+. Both, ACCP (odds ratio [OR]: 0.76; 95% confidence interval [CI]: 0.74–0.78) and RF (OR: 0.68; 95% CI: 0.66–0.70) positivity were associated with lower odds of sustained remission (P < 0.05). Conclusion: Dual antibody-positive status at presentation carries poor prognosis, higher disease activity, higher HAQ score, and lesser chance of remission in RA patients with conventional treatment. Patients with both antibodies negative status had the best prognosis. Although patients with discordant antibody status had an intermediate prognosis, the ones with ACCP had higher disease activity at follow-up. Rheumatoid arthritis (RA) is a chronic inflammatory disease. The presence of rheumatoid factor (RF) positivity or anti-cyclic citrullinated protein (ACCP) antibody is used as one of the criteria for diagnosing RA. Studies from biobanks in Sweden and Finland have also shown that RF and ACCP can exist in patient's serum way before they present clinically as RA. The presence of either RF or ACCP has been shown to be strong predictors of radiographic progression. However, the clinical prognostic value of each of the antibody, singly or in combination, has not been well studied. The main thrust of this study was to check, which antibody combination detected at presentation imparts a better prognosis during follow-up. An electronic database of all patients attending the outpatient department was maintained since 2015. From this records of patients with the diagnosis of RA were obtained. RF and ACCP tests were advised to all patients who were diagnosed with RA using the ACR criteria. Consecutive patients who had both these investigations done were included in the study. A total of 945 such patients were found. The mean disease duration of the patients and their previous therapies could not be ascertained from the available data. IgM antibody RF was determined using the immunoturbidimetry method. ACCP was detected using the enzyme-linked immunosorbent assay to detect the IgG antibodies. Chorus immunoassay analyzer was used for this test. All patients received conventional DMARDs, such as methotrexate, hydroxychloroquine, leflunomide, and sulfasalazine. Methotrexate was used as the drug of choice unless contraindicated or not tolerated. Other drugs were added as required to achieve a low-dose activity (LDA) and preferably a remission. Their antibody status was not taken into consideration while treating them. The patients were treated with the intention to achieve LDA or remission irrespective of their antibody status and disease duration. Prospective records were obtained for all patients. The patients were followed up for the period ranging from 3 months to 24 months (median – 6 months) at different time intervals. They were followed more frequently (4 weekly) at the beginning of their treatment and later 3–4 monthly. Disease Activity Score (DAS) 28 was calculated using a computerized program with the four variables, namely, erythrocyte sedimentation rate (ESR), tender joint count, swollen joint count, and global assessment. Indian modified Health Assessment Questionnaire (HAQ) using 36-item questionnaire was used to calculate the HAQ Score. DAS28 and HAQ score were calculated during each visit of the patient. Patients were excluded if both ACCP and RF antibody data were not available. Patients were also excluded if only a single observation was recorded and/or the follow-up duration was <1 month. Those patients were also excluded where the DAS28 based on 28 joint counts could not be computed for want of sufficient data. The outcome variable examined and included in the study was the achievement of sustained remission, defined as at least two consecutive visits which were separated by a minimum by 1 month with DAS28 of ≤2.6. The two consecutive visits ranged from 4 weeks to 12 weeks interval (average – 2.5 months). ACCP and RF were considered as dichotomous variables, i.e., seropositive and seronegative. Since the antibodies considered in the study were looked at dichotomously, their association with the outcome variable, i.e., sustained remission was analyzed using logistic regression. Significance was tested using Chi-square test for discrete variables and Student's t-test for continuous variables. The analysis was performed using SPSS (Version IBM SPSS Statistics, IBM Corporation, Armonk, NY, USA) statistical software. Values of P < 0.05 were considered statistically significant. The characteristics of the patients at the time of enrollment are presented in [Table 1]. A total of 945 patients were enrolled as a part of the study, 577 were female (61%). The average age of the males was 44.7 years while that of females was 38.2 years. Majority of the patients were positive for RF, namely, 718 (76%), whereas ACCP was positive in 670, i.e., 71%. Dual (RF and ACCP) positive antibody status was the most seen among the 539 (57%) of the patients. Both antibodies were negative in a small 161 (17%) of the patients. There was no significant difference in the incidence of single positivity status in discordant states, i.e., between RF +/ACCP−and RF−/ACCP+. The differences between various combinations of ACCP (+/−) and RF (+/−) patients in disease activity measures (DAS score, HAQ, ESR, and swollen joint count) measured at inclusion and after a median follow-up of 6-month follow-up are presented in [Table 2]. Thus, it can be seen that patients with dual-positive antibody status had the worst presentation and highest disease activity at the baseline. Both antibody negative status had a milder presentation and low disease activity at the baseline. Among the discordant antibody status, ACCP positivity portended a significant higher disease activity state at presentation as compared to RF positivity. The DAS28, HAQ score, and ESR were significantly worse in the ACCP+/RF– group as compared to ACCP−/RF+ group. DAS score was significantly higher in ACCP+/RF + at follow-up as compared to any other dual antibody group (P < 0.05). Similarly, HAQ was also significantly higher in ACCP+/RF+ as compared to other dual antibody groups (P < 0.01). ESR and swollen joint count also demonstrated the same characteristics both at enrollment and after 6 months (P < 0.05). This suggests that dual positivity portended an aggressive disease, poorer response to conventional treatment, and higher disease activity at follow-up as compared to any other group. As expected, dual antibody-negative status was associated with the least disease activity state at follow-up. The patients with discordant-positive status had an intermediate response. However, among them, ones with only ACCP +ve had a higher disease activity, DAS, HAQ, ESR, and swollen joint count than the ones with only RF +ve status. The change in disease activity measures between enrollment and after 6 months is shown in [Table 2]. The parameter of 6 months was used as it was the duration of median follow-up of the cohort. The analysis demonstrates that in the case of DAS score and ESR, the maximum change was observed in the case of RF+/ACCP+ patients. The highest percentage change for HAQ was observed for RF+/ACCP− patients (42.8%) while in the case of swollen joint count, the maximum percentage change was seen in RF−/ACCP+ patients (44.5%). Sustained remission (included >2 consecutive visits which were at least 1 month apart and with DAS 28<2.6 at each visit) was observed in case of 264 (28%) patients. The remission was assessed at any stage of the follow-up, irrespective of the duration from their enrollment in the study. The proportion of patients in sustained remission according to dual antibody groups is as shown in [Table 3]. This table illustrates the difference between the numbers of patients in sustained remission between the different dual antibody groups. Sustained remission was significantly higher in anti-CCP-negative and RF-negative antibody group (34.2%) with P < 0.05 followed by anti-CCP-positive and RF-negative antibody group (32.4%) with P < 0.05. Again, as expected, the least proportion of patients in sustained remission belonged to anti-CCP-positive and RF-positive antibody group with P < 0.01. Both, ACCP (odds ratio [OR] 0.76; 95% confidence interval [CI] 0.74–0.78) and RF (OR: 0.68; 95% CI: 0.66–0.70) positivity were associated with lower odds of sustained remission (P < 0.05). This study dissects the role of dual antibodies in severity at presentation, response to conventional disease-modifying agents, and prognosis in Indian RA patients at a single center. Patients with both antibodies positive have higher disease activity, swollen joint count, HAQ score, and ESR at follow-up after treatment. The remission rate is also the lowest in this group. This suggests that dual antibody positivity portends an aggressive disease and poor response to treatment at follow-up. Conversely, both negative antibodies portended lowest disease activity, lowest HAQ at follow-up, and the highest rate of sustained remission. Patients with discordant antibody status had an intermediate prognosis. However, which of the two antibodies carries a worse prognosis is unclear. While the group with only RF positivity had better parameters at follow-up, the group with only ACCP positivity had a higher sustained remission rate. The odds of going in remission was higher with ACCP positivity (alone or in combination with RF) than RF positivity. Hence, the significance of these findings in discordant antibody status is unclear. The response to treatment and fall in disease activity depended on the severity at presentation, irrespective of antibody status. Thus, the scores of disease activity fell maximum in both antibody-positive group and least in both negative antibody groups. A lot of data exist suggesting association of RF, ACCP, and erosions of radiography in RA patients at presentation.,,,, However, the data on concordant and discordant dual antibody status and its effect on future disease activity and rate of remission are sparse. Miriovsky et al. have also shown that ACCP positivity and its concentrations are associated with a greater disease burden over time in US veteran having RA. This study is in agreement with the finding that dual antibody positivity portends poorer prognosis and that RF positivity was associated with lower remission rates in discordant antibody status. However, this study was done in an atypical population of RA patients, comprising mainly of men. Nishimura et al. in their meta-analysis have suggested ACCP to be a better predictor of poorer prognosis and an erosive disease in RA patients. However, the meta-analysis consisted of heterogeneous studies and its role in discordant antibody status was unclear. In RA, the autoantibodies produced in lymphoid organs and synovium are specific for citrullinated peptides (CCP). The antigen-antibody complexes which deposit in the joints are composed of citrullinated fibrinogen, type II collagen, alpha-enolase, and vimentin. The antibodies to these antigens are ACCPs. Whereas, RFs are autoantibodies to Fc portion of their own IgGs. A poorer prognosis with ACCP rather than RF suggests that antibodies against ACCP may be more pathogenic than antibodies against IgG. Quin et al. in their analysis looking at improvement in HAQ from baseline showed that patients with RF positivity and high baseline HAQ were less likely to demonstrate functional improvement at follow-up (P < 0.05), while there was just a trend for ACCP-positive patients (P = 0.07). In the RF-negative subgroup, higher titers of ACCP antibody were significantly associated with the absence of functional improvement from baseline at 24 months (P < 0.05). This study is unique in that it tried to use dual antibodies in prognosticating the future disease activity in RA. We are not aware of similar studies in Indian patients. There are several shortcomings in the study. It would have been ideal to check the effect of ACCP and RF titers on the prognosis. Although we estimated the titers of RF and ACCP, further classification into subgroups based on titers made a small sample size in each group. Hence, the effect of titers of these tests on the prognosis of the disease could not be determined. Next, the duration of disease and previous therapies could have affected the prognosis and the progression of the presenting patient. Although our data did not allow us to analyze this confounder, it can be safely presumed that this phenomenon affected all the groups uniformly. The definition of sustained remission is not well very clear. Miriovsky et al. used >3 months remission as the definition of sustained remission. However, to encompass maximum number of patients with a reasonable period of remission, we defined remission between two visits at least 1-month apart as sustained remission. The question of “what period of sustenance to call as sustained remission” is open to debate. If the definition of sustenance is extended too long, it is possible that some patients may have a period of increased disease activity in the interim. It is possible that in the patients who were followed up at the larger interval, say at 4 months, and also had sustained remission, could have had a small period of increased disease activity in these 4 months. Our data could not identify these patients. Our study highlights that addition of ACCP to RF determination not only adds to sensitivity in diagnosing RA but also in prognosticating it. Furthermore, checking the titers of these tests may further add to determining the severity and future consequences of RA. Hence, we suggest that all RA patients should undergo RF as well as ACCP measurements at presentation. This may help in determining the aggressiveness of the planned treatment. We would like to acknowledge the role of Dr. Lata Bichile for giving inputs in the preparation of manuscript. Aletaha D, Neogi T, Silman AJ, Funovits J, Felson DT, Bingham CO 3rd, et al. Rheumatoid arthritis classification criteria: An American College of Rheumatology/European League Against Rheumatism collaboration initiative. Arthritis Rheum 2010;62:2569. Paul BJ. Pre-rheumatoid arthritis. In: Chaturvedi V, editor. Manual of Rheumatology, 5th ed. Mumbai: CBS Publishers & Distributors Pvt Ltd.; 2018. p. 255. Syversen SW, Gaarder PI, Goll GL, ødegård S, Haavardsholm EA, Mowinckel P, et al. 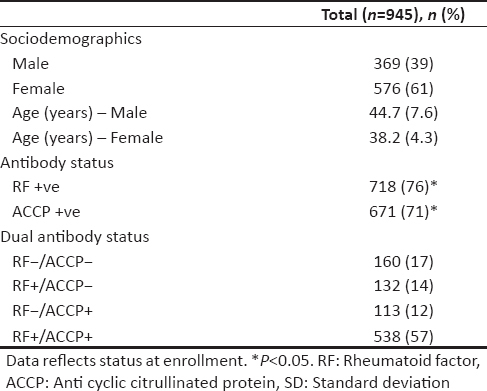 High anti-cyclic citrullinated peptide levels and an algorithm of four variables predict radiographic progression in patients with rheumatoid arthritis: Results from a 10-year longitudinal study. Ann Rheum Dis 2008;67:212-7. Dhanalaxmi A, Shruthi N, Rajendran R. Anti – cyclic citrullinated peptide antibodies: Clinical utility and their role as early prognostic markers in erosive rheumatoid arthritis. Int J Biomed Res 2015;6:391-4. Gupta R, Thabah MM, Aneja R, Kumar A, Varghese T, Chandrasenan PJ, et al. Usefulness of anti – CCP antibodies in rheumatic diseases in Indian patients. Indian J Med Sci 2009;63:92-100. Agrawal S, Misra R, Aggarwal A. Autoantibodies in rheumatoid arthritis: Association with severity of disease in established RA. Clin Rheumatol 2007;26:201-4. Nishimura K, Sugiyama D, Kogata Y, Tsuji G, Nakazawa T, Kawano S, et al. Meta-analysis: Diagnostic accuracy of anti-cyclic citrullinated peptide antibody and rheumatoid factor for rheumatoid arthritis. Ann Intern Med 2007;146:797-808. Miriovsky BJ, Michaud K, Thiele GM, O'Dell JR, Cannon GW, Kerr G, et al. Anti-CCP antibody and rheumatoid factor concentrations predict greater disease activity in men with rheumatoid arthritis. Ann Rheum Dis 2010;69:1292-7. Horvai A. Bones, joints and soft tissue tumours. In: Kumar V, Abbas AK, Aster JC, editors. Robin's and Cotran's Pathologic Basis of Diseases: South Asia Edition Vol II. Mumbai: RELX India Pvt Ltd, Formerly, Reed Elsevier India Pvt Ltd.; 2015. p. 1210. Quinn MA, Gough AK, Green MJ, Devlin J, Hensor EM, Greenstein A, et al. Anti-CCP antibodies measured at disease onset help identify seronegative rheumatoid arthritis and predict radiological and functional outcome. Rheumatology (Oxford) 2006;45:478-80.